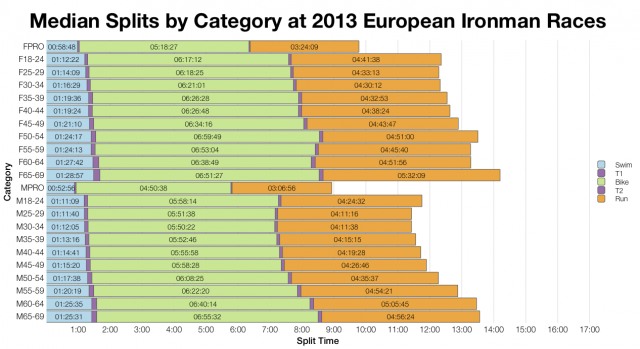 It’s a busy weekend for Ironman racing, but with Mallorca (and Malaysia) already done I can start the analyses early. So, to begin: Ironman Mallorca, the first full distance Ironman event to take place on the island, building on the success of the 70.3. 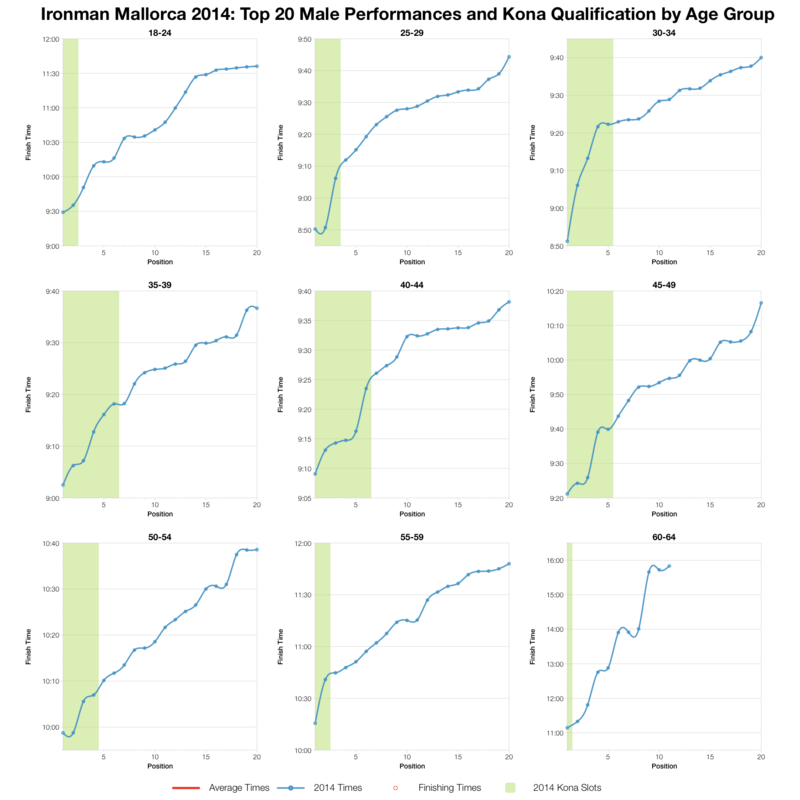 With 50 slots on offer Mallorca is a good choice for Europeans looking to qualify early for the 2015 Ironman World Championship. As I can’t look back at previous races in Mallorca I’ll compare the median splits from yesterday’s race with those from all European races last year. 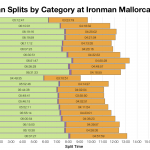 For the most part splits from Mallorca compare closely with the European aggregates – the only difference of any note being faster swim times in Mallorca. 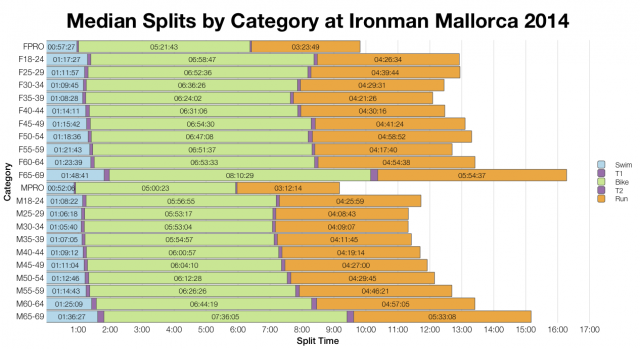 Professional splits are very similar too, so Ironman Mallorca appears to fit somewhere in the middle of the European events. The distribution of splits further reinforces this point with broadly similar patterns across the charts. Again, it’s only the swim that is strongly skewed towards faster times than its European counterpart. 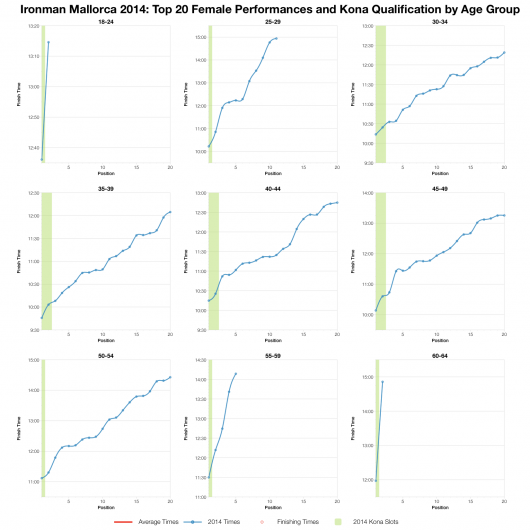 At the front of the age group race there are fast times – very fast in some cases. 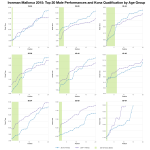 While the overall distribution of result might fit with the European averages, the front of the race – particularly the men’s race – is better compared to one of the fastest Ironman races, Frankfurt. 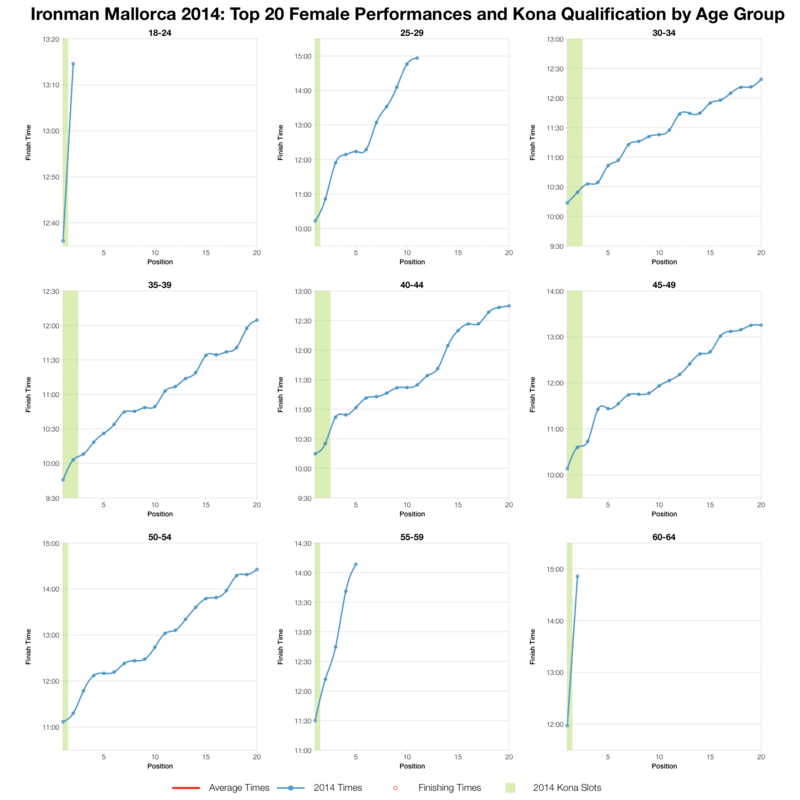 The top male (and to a lesser extent female) times fall very close to the averages for the top twenty in Germany which suggests there was some good competition for those early Kona slots on offer in Mallorca. 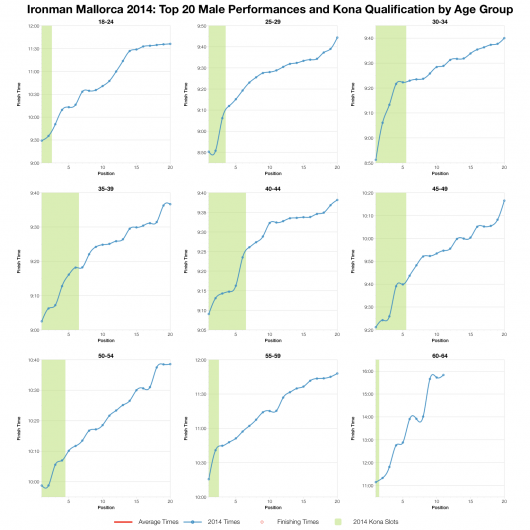 So year one in Mallorca and the new event appears to be an ‘average’ European Ironman that comes with a competitive edge. An early chance to qualify, but also a challenging one. 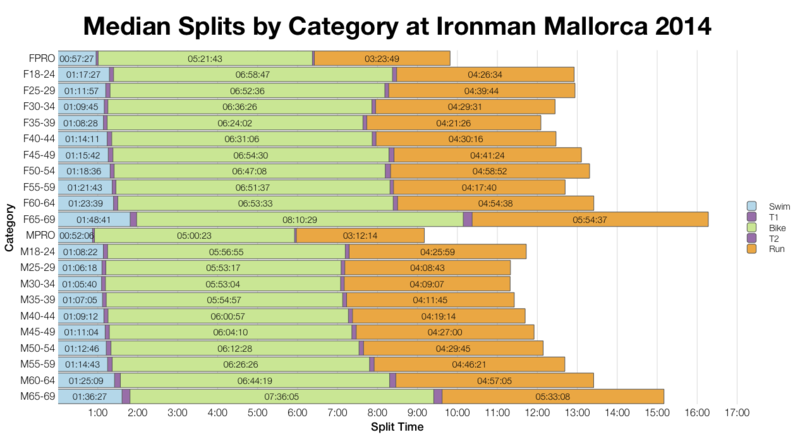 A spreadsheet of the full results and splits from Ironman Mallorca 2014 is available on my Google Drive.